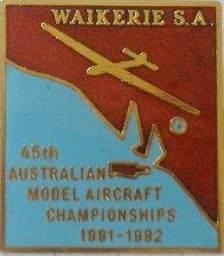 Nationals Results Control Line 1938 to present. 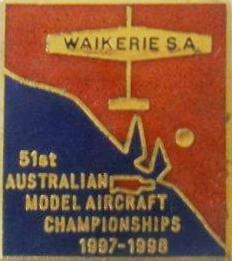 Hosted by Free Flight Society of N.S.W. 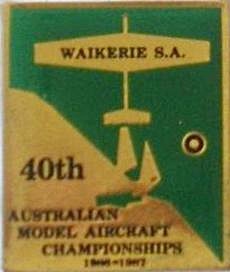 Aerobatics Events - Whalan NSW. Speed, Racing & Combat Events - Albury NSW. 1 J.Oehme/R.Silva - 2 H.Bertina/C.Stone - B. Eather DQ. 1 V. Gray (New Zealand) 5min. 5.4sec. 2 J. G. Habib (Lismore, NSW) 4min. 58.4sec. 3 H.E. Vivian (South Australia) 4min. 54sec. 1 J.G. Habib (Lismore, NSW) 4min. 29sec. 2 J. Fullarton (Sydney) 4min. 15sec. 3 R. Hardy (Sydney) 2min. 34sec. 1 S. Parkinson (Victoria) 9min. 52.8sec. 2 G. Harder (Lismore, NSW) 9min. 34.4sec. 3 S. Drury (South Australia) 9min. 6sec. 1 V. Gray (New Zealand) 11min. 23.2sec. 2 J. Fullarton (Sydney) 9min. 15sec. 1.B. Felstead (South Australia) 8min. 29sec. 2 R.E. Allen (New Zealand) 7min. 58.8sec. 3 J. Black (South Australia) 7min. 52sec. Ken Maier, Steve Rothwell, Richard Bellis, Paul & Lyn Turner, Kevin Dodd M.A.A.A. & ACLN Magazine.